Boagrius is played by Nathan Jones (Charlie’s Farm), a monster of a man at a lean and mean 6’11”/360. 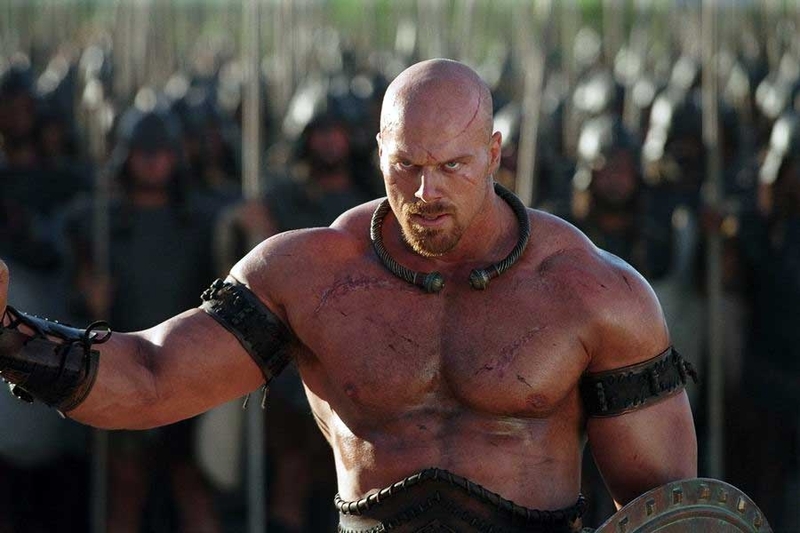 Most likely type-cast as “over-sized muscular warrior guy” he has menaced the screen in Conan the Barbarian (2011), The Condemned (2007), Fearless (2006), The Protector (2005), Jackie Chan’s First Strike (1996) and even Mad Max: Fury Road (2015)—meaning he has faced Jason Mamoa, Steve Austin, Jet Li, Tony Jaa (Ong-Bak) and Jackie Chan! Not a bad resume for a Big’n’Tall baddie. This fight is super brief, but super awesome. And Pitt’s jumping stab down the collar bone had me speechless when I first saw it while keeping me wowed every time I see it again. Hector is played by Eric Bana (Hanna, Star Trek). This fight opens with badass lines, has nail-biting music, and drips amazing spear and shield-fighting choreography that Hollywood had never before seen! Yup, movie action and combat choreography has come a long way over the decades, hasn’t it? Anyway, I hope you like these fights as much as I did and, if you haven’t seen the movie, I hope that you now have a reason to watch it. To find more of my best fights just do a search for “best fights of film” in our search box.